Jason Kim is a Korean-American foodie with a passion for cooking, eating and photographing. He currently lives on Jeju Island and updates his popular blog, mykoreaneats.com, where this article originally appeared. So many restaurants here specialize in so-called “well-being” food, but it is still hard to come by a restaurant that is both healthy and delicious. 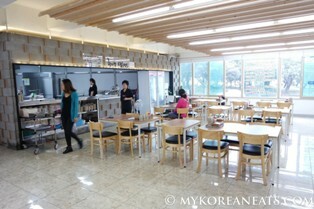 That is why it was a nice surprise when my partner and I stumbled upon “Haruebang Milmyeon” in Ora-dong, Jeju City. Haruebang Milmyeon (Grandfather Buckwheat Noodles) serves up only five dishes, all of which include the superfood seaweed tot (hijike), except the suyuk (boiled pork). 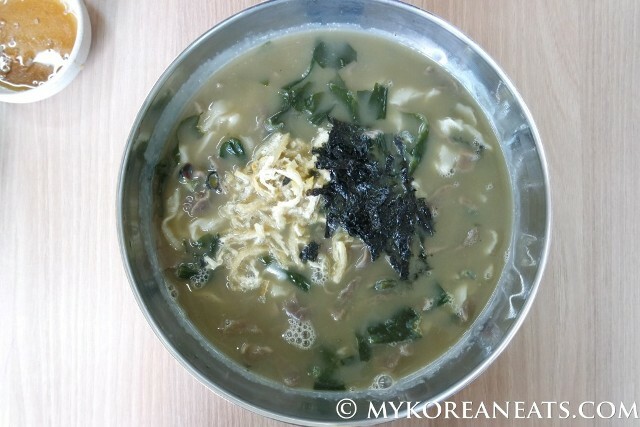 The bomal kalguksu (a kind of sea snail and hand-cut noodles) combines tot-infused and regular flour noodles and it was thick, hearty, and invigorating. Although I’m not a big fan of noodles and sea snails in general, the ingredients were balanced well and the texture made each bite very interesting: soft, slippery noodles; chewy, slightly rubbery sea snails; silky seaweed. The bibim myeon (sweet ‘n’ spicy noodles with vegetables) was another winner with all the right flavors in the sauce (sweet, spicy, kind of tangy) and the vegetables perfectly cut for that much-needed crunch. No doubt that this will be the perfect dish, along with their mul milmyeon (spicy noodles in cold broth), in the warmer months just ahead. Lastly, the wang mandu— “king dumplings,” resembling baby brains and generously filled with Jeju pork, vegetables and eggs—were indeed regal. Not so yours truly, however, who was eating like a food-deprived beggar after one bite. All in all, we not only finished our meal feeling as full as can be, but we were happy to finally enjoy a meal that was thoroughly healthy and handmade to perfection. This tree-like seaweed with elongated bulbs on its stem, is loaded with minerals, calcium, fiber, iron, and iodine. It is supposed to lower cholesterol, prevent osteoporosis,hypertension, obesity, diabetes, and even sexually transmitted diseases. A spiral and pyramidal top shell marine mollusc, bomal is full of protein, literally fat-free, and prevents osteoporosis, liver cirrhosis and hangovers!